SAN JUAN [Bautista] NORTH, October 21.–Earthquake at 7:55 A.M. The shock was of at least thirty seconds duration, and the heaviest since that of October, 1865. October 21, 1868: Magnitude 7.0 37.70, -122.10 Hayward Fault 30 dead; $350,000 in property damage. Smallpox epidemic in San Juan Bautista. Source: Isaac L. Mylar, Early Days at the Mission San Juan Bautista, p. 147, and web based reports. 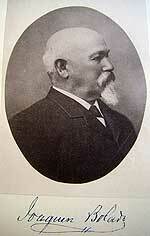 See: http://memory.loc.gov – search for "mylar"
1858: Plaza Hotel in San Juan Bautista built by Angelo Zanetta.